Something doesn’t really fit in. he doesn’t look the same, play the same or even have the same sort of packed lunch. One night there is a knock at his door. It is another Something but it is not the same as him and at first he doesn’t see what they have in common. Then he thinks about it, realises he was wrong and has a change of heart. The more they do together the more they discover just how much they have in common. This is a brilliant book, not just about fitting in and acceptance, it celebrates differences and examines our attitudes towards each other. The story is beautiful in it’s simplicity and the accompanying illustrations are quirky and fun. 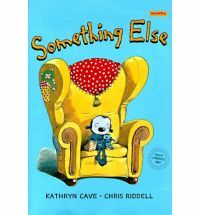 This is a wonderful picture book, one I fell in love with the first time I read it. Josh is very brave, there are only a few things that scare him. His granddad tells him great stories but sometimes they are scary. 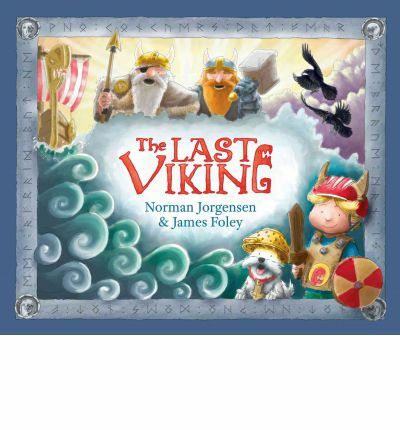 This time when he stays over his granddad tells him all about the vikings. Josh likes the sound of them and decides he wants to be one. He talks to the viking gods and sets out to do the sort of things vikings do. It turns out that Josh makes a pretty good viking, proving this when he stands up to the bullies, with surprising consequences. This is a wonderful little story that embraces the imagination, individuality and standing up to the bullies. Josh is a wonderful character. The story is incredibly charming, and the illustrations wonderfully complement the text. Recommended for any child with an imagination and the courage to dream. George is a mouse who lives in a hole in an old castle wall, high in the mountains. He is small, rather timid and a bit clumsy. 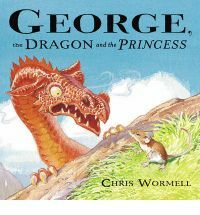 George has a secret though, there is this one thing he can do really well and when the dragon arrives he springs into action. This one thing means he is able to make friends with a princess. Do you know what George’s secret is? A charming little story about finding what you are good at. The text is simple, the story pleasant and the illustrations amazingly detailed. A nice story to share. Princess Rosamond is not a typical princess. She isn’t interested in fancy clothes or looking good, she would much prefer to spend her time with a good book. She also keep busy balancing the royal accounts and makes sure the drawbridge stays in working order. Then her father gets remarried and her stepmother and stepsister are only really interested in the royal treasury. They scheme to keep Rosamond out of the way. 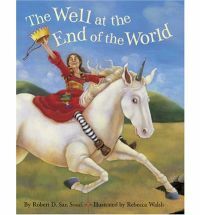 When her father falls ill Rosamond chooses to set out in search of the one thing that might cure him – the healing waters from the well at the end of the world. Along the way Rosamond has plenty of opportunity to help or be selfish. Which path will she take and what things will happen as a result of her journey? A wonderful fairytale-esque story. It contains a feisty heroine who uses generosity, intelligence and courage to get what she needs as opposed to servants, orders and selfishness. Walsh has painted wonderful illustrations that manage to somehow be both classic and contemporary. This is a great adventure story twisted through with a strong moral strand. It can stand as it is, providing a good example or be a springboard to discussions on attitudes. There is plenty of text which makes it a great choice for kindy/pre-primary or year one readers not quite ready for chapter books. Recommended. It is Splat’s first day of school and he is really nervous. he keeps looking for excuses and his Mum keeps coming up with solutions. He finally gets to school and finds everyone, including his teacher are very friendly. In his lessons he is told that cats chase mice, this bothers him a little and he wants to know why they do because he has a mouse friend called Seymour. When the other cats see Seymour they start to chase him. Then something happens and the only one who can save the day is Seymour. An adorable story about the first day of school that covers everything from nerves and friends to fitting in. 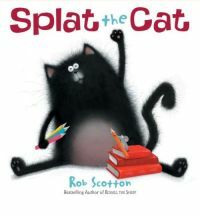 Easy to understand text combined with simple, fun illustrations make this a highly appealing read. Edward Tulane is a china rabbit who is very pleased with himself. He belongs to a girl named Abilene who loves him and treats him with the utmost care. he sits at the table with the family for dinner and has dozens of clothes. He is a very important rabbit. Or so he thinks. He never, not once thinks about anyone but himself. Then one day he gets lost. This isn’t the end for him it is simply the beginning. He goes on a remarkable journey of self-discovery and along the way comes to understand what it is to love and be loved. This is a surprisingly beautiful story. What could be interesting about a self-important, over dressed china rabbit? The story makes it interesting. It is so wonderfully written, the characters so varied and Edward’s journey beautifully developed that you want to be with him on it.